Waihi College student Amaru Donaldson has more on his mind than school at the moment. 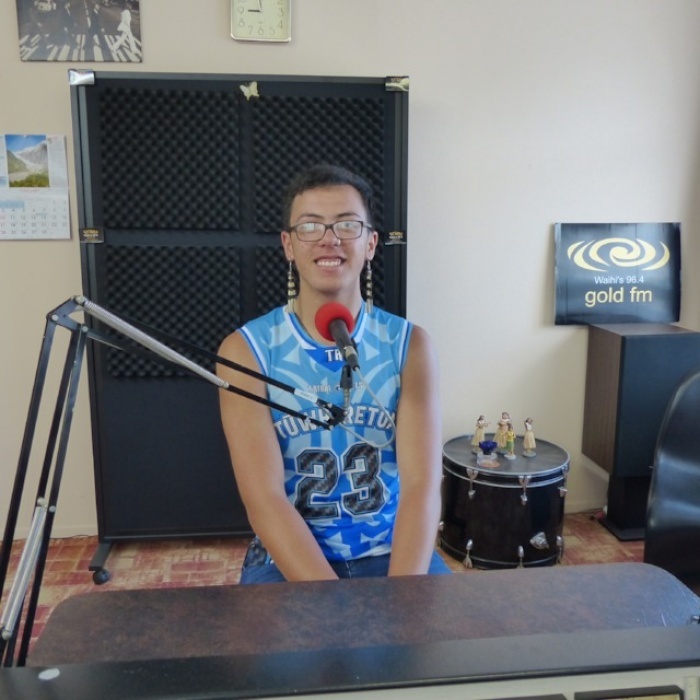 He called into the Gold FM studio to talk to Brian Gentil about his achievements in kapahaka. Amaru is 16 years young and tutors the Waihi College kapahaka group. His passion and skill have been noticed because he has been invited to perform with a group from Tauranga at Te Matatini, New Zealand's largest traditional Māori cultural arts festival. Amaru has had a very busy summer with practices every weekend and is bracing himself for a hectic time in the lead up to the Te Matatini festival. He spoke to Brian about how he developed his love of kapahaka and what it took to be chosen to represent a highly skilled kapahaka group in Wellington at the Westpac Trust Stadium when Te Matatini starts on February 20. Amaru is on a steep learning curve and relishing the opportunity to watch and learn from other kapahaka performers and groups. He is dedicated to focussing on kapahaka and doing the best he can for his group Te Kapa Haka o Ngāti Ranginui. Kia kaha Amaru! All the best in your kapahaka endeavours. Te Matatini Kapa Haka Festival runs between February 20 and 24 at the Westpac Trust Stadium in Wellington. Te Matatini Chairman, Selwyn Parata, said the venue was selected as it would cater well for crowds and was easily accessible due to Wellington’s extensive public transport network. "Westpac Trust Stadium has the X-factor to ensure not only an affordable and successful festival for whānau, but one that attracts non-Māori audiences and international visitors. It is a multi-purpose facility with a 34,500 seat capacity, a 350 seat VIP lounge capacity, 15 food and beverage outlets, 750 public carparks and is a stone’s throw away from the Wellington Railway Station." Listen to our podcast to hear what Amaru had to say when he spoke with Brian Gentil.